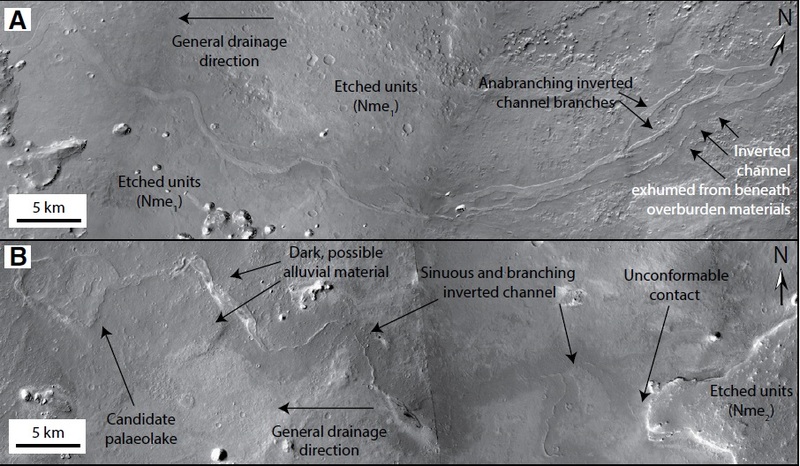 Sciency Thoughts: Ancient fluvial systems on Arabia Terra, Mars. Modern Mars has an arid climate combined with an atmosphere to thin to support liquid water and a surface temperature seldom warm enough to allow ice to melt. However much of the surface of Mars shows evidence of a wetter climate in the past, with river systems, lakes and even shallow seas being identified by planetary scientists. This has led to the theory that during the Noachian Period, more than 3.7 billion years ago, Mars had a warmer, wetter climate with extensive precipitation (rainfall) and water dominated environments covering much of the surface of the planet. However some of the ancient terrains predicted by this model as having been likely to have had very wet climates during the Noachian are devoid of any signs of water. This has led to the development of an alternative climate model for ancient Mars, the Icy Highlands model, in which the climate of ancient Mars was still predominantly cold and dry, but with extensive glaciation forming in highland regions, particularly around the equator, and the water-created landforms of Mars being created by rare episodes of warming which melted these ice caps leading to catastrophic but short-lived floods. In a paper published in the journal Geology on 23 August 2016, Joel Davies of the Department of Earth Sciences at University College London, Matt Balme of the Department of Physical Sciences at the Open University, Peter Grindrod of the Department of Earth and Planetary Sciences at Birkbeck College, University of London, Rebecca Williams of the Planetary Science Institute and Sanjeev Gupta of the Department of Earth Sciences and Engineering at Imperial College London describe evidence for a network of fluvial (river) channels covering much of the Arabia Terra, the largest of the 'dry' Noachian Terrains of Mars, and therefore one of the biggest obstacles to the Warm an Wet model of the ancient Martian climate. These channels are detected in images produced by the Context Camera on the Mars Reconnaissance Orbiter, and take the form of sinuous ridges and branching systems rising up to 60 m above the surrounding terrain and flowing with and around topological features in a way that would be predicted for fluvial channels. Ridges are not an obvious sign of fluvial activity, but can be formed if river channels develop a more robust structure that the surrounding terrain, for example a stony riverbed or even river-bottom carbonate deposit in an area otherwise covered by loess (dusty, easily wind-blown soil), which can lead to the riverbed remaining as a raised, or 'inverted', channel after the surrounding terrain has been eroded away. Such inverted riverbeds are not purely theoretical they are familiar from desert regions on Earth, and are therefore to be expected on Mars if that planet once had a wet climate but has subsequently aridified. Map showing distribution of inverted channels (black lines) and valley networks (white lines) in Arabia Terra, Mars, study area. Many of the inverted channels (e.g., southwest region of study area) are not associated with valley networks. Background image is Mars OrbitalLaser Altimeter gridded topographic map. Davies et al. (2016). These channels are not evenly distributed across the Arabia Terra, but rather are concentrated in the southwest, with the northwest and east of the terrain largely devoid of such structures. This is consistent with large-scale water-flows from the north to the south, draining into the Meridiani Planum to the south and southwest of the Arabia Terra, though a number of streams appear to drain into other features, particularly craters that may once have held ancient lakes. 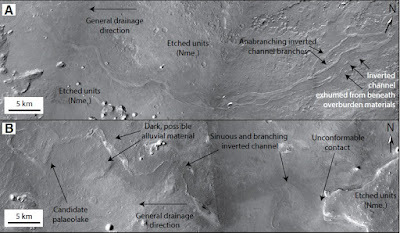 Mars Reconnaissance Orbiter Context Camera mosaics of (A) anabranching and sinuous inverted channel system (Aram Dorsum; candidate ExoMars landing site) in southwest Arabia Terra; and (B) branching and sinuous inverted channel system in southwest Arabia Terra, terminating in terraced, sub-circular feature consistent with inverted paleolake deposit. Both inverted channels are unconformably overlain by regional etched units. Davies et al. (2016). Based upon the relationships of the channels to other geographic features, Davies et al. conclude that the channels were probably active in the Middle-to-Late Noarchian. The presence of the channels on the Arabia Terra, one of the largest areas on Mars on which fluvial structures had not previously been identified, lends considerable support to the warm and wet hypothesis of early Martian climate, a model which predicts a wet climate in the Arabia Terra region, and which was stretched by the absence of such evidence.